Dr. Fleming: Haven't found it yet. There is a high mountain with the name Mount Ararat on the border between Eastern Turkey and Armenia. Unfortunately, it is a border area with people who haven't had good relations. You can't just easily go and excavate and explore. The other problem we have is that there was a partial ice age in the late 1500's and the early 1600's AD giving us most of the glaciers we have here in the United States as well. There is a Turkish inn that we know of from 1500 that used to be on a mountain pass there. With the melting of some of the glaciers some wood protrudes from something which is a three story Turkish inn known from sources. You can imagine the religious imagination wanting to prove that is the ark. The other factor is there is a natural erosion of gullies that make patterns that look sort of pointed on either end in the ground. One of those a producer named Ron Wyatt suggested was Noah's Ark. He wanted it so much to be Noah's Ark that he took a metal detector and walked every foot back and forth. Well, let's say it is pointed. Wyatt walked in straight lines and had a white rope with him and creating parallel lines. Every time there was a beep he put down a rock and he photographed that spot, claiming those were nails from the floor boards of Noah's Ark. Now, stop and think about it, if he had walked curlicues with a rope and every time it bleeped he put a rock down, then curlicue is how it would look. The shape was based on the way he walked right? It is just crazy I'm sorry to say. The Bible says Noah's Ark rested on the mountains of Ararat, not Mount Ararat (Gen. 8:4). 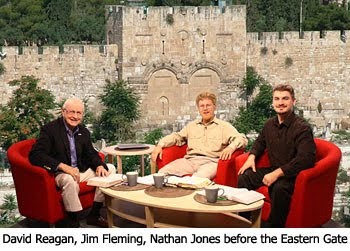 Generally, that is uphill from Mesopotamia, the Tigris and Euphrates rivers. It seems to be the correct area. Does Noah's Ark really have to be preserved, though? We need to be cautious. 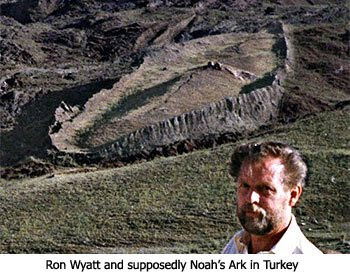 Ron Wyatt was either a 'fruit cake' or a blatant liar! Also a 7th Day Adventist.